Today there’s a sweet potato burger on the menu! 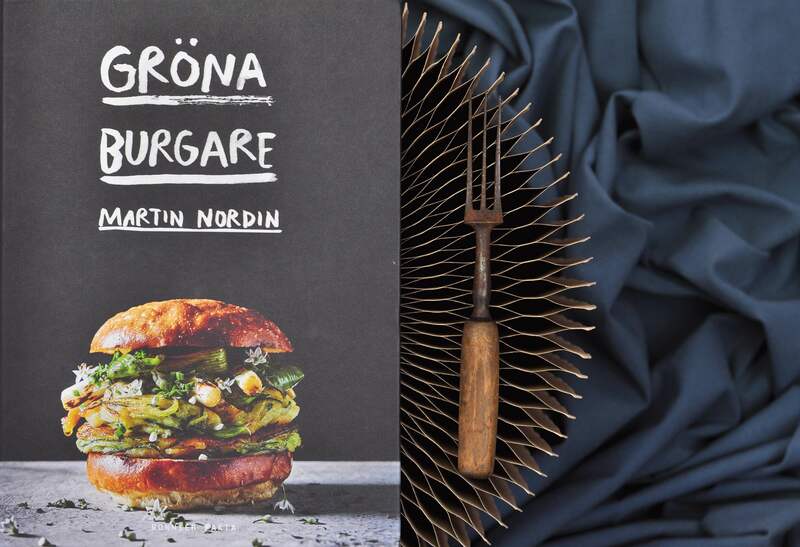 The recipe comes from the book Green burgers written by Martin Nordin. Of course, you will also get a review of the book as well as the recipe for fun sweet potato burgers with almond feta and blackened vinegar. The first thing that strikes me is how beautiful the book is. It is easy to understand that the author Martin Nordin works with advertising and communication as a profession. The photos are simple but colorful and invites to new adventures with burgers of all kind. In addition to a whole bunch of burgers based on both vegetables, cabbage, mushrooms, root vegetables and different lentils and beans, the author also have recipes for several accessories going well with the burgers. How about some guacamole made of green bananas, sea buckthorn mayonnaise, kimchi made with cabbage and rhubarb or homemade ketchup? NAMNAM! It’s fun to see how you think in a new way around something as classic as a hamburger. What is actually a hamburger? A construction package with bread, meat, some vegetables, ketchup and maybe some pickled cucumbers? Or could it also consist of homemade brioche, seasonal vegetables and homemade mayonnaise? Of course it can! One of the hardest thing I think for many beginners (and more experienced green eaters) when trying to switch to more veggies, is to make a burger that holds together. In the book, Martin shows how to easily solve the problem. Sometimes with the help of eggs but also by utilizing the different consistency that beans, lentils or different carbohydrate sources such as rice and potatoes can yield. Of course you can make a nice burger without animal products, you just have to think in a new possibilities! The second difficulty in switching to more vegetables may be that you lack the rich flavor that meat and fish can give, the so-called umami flavor. The author solves this by using for example very slowly roasted onions, dried mushrooms, miso paste and seaweed. Excellent examples that can be used in so many other dishes part from burgers! From the book I have chosen an exciting recipe with sweet potato burger with almond feta and blackened vinegar. I changed the traditional feta cheese to homemade almondfeta cheese (see link for recipe). In the book the burger is served on a brioche bread but choose the bread that you think suits your burger the best. I baked my own bread, but further I followed the recipe just as it says. It will be an exciting combination between the sweet taste from sweet potatoes and the black garlic, the tasty pepper mix and the blackened vinegar. I had real fun making it! But let’s get to work! 1. Pre-heat the oven to 200 ° C.
Heat a dry baking pan on medium heat. Roast the coriander seeds, Sichuan peppers and black pepper until the seeds start to become golden brown and you feel a nice smell of the spices. Pour the roasted peppers in a mortar or mix them into a fine powder in an electric coffee grinder. Store in a glass jar. 3. Cut the green from the spring onion. Place it on a plate prepared with baking parchment and grill it hard in the oven until it is completely black – it takes about 20 minutes. Slice the white part of the onion thinly and save to garnish. Put the burned greens from the spring onion in a blender and mix it to a fine powder. Add vinegar, black garlic and 1 teaspoon of the pepper mix and mix to an even consistency. Taste with salt. 4. Heat up some oil in a baking pan until it starts to smoke. Bake the sweet potatoes with the skin on all around until the skin is crispy, on the edge of burned. Place the potatoes in a ovenproof dish, sprinkle over the sea salt and bake in the oven for about 45 minutes or until the potatoes are completely soft. 5. Cut the potatoes lengthwise and gently scoop the inside with a spoon – try to get everything out in one time so that the potatoes are not mashed. 6. Grease the bread on the cut surface and fry them quickly in a frying pan or grill them in the oven. 7. Prepare the sweet potato meat into 6 round steaks as much as possible, either by hand or by using a round cookie cutter. Add a sweet potato burger to each bread. Brush on some of the blackened vinegar mix, crumble some (almond) feta cheese on each burger. Add sliced ​​spring onion and some fresh marjoram and oregano. This recipe is naturally free of gluten, lactose (if you use an herbal feta cheese) and nuts.